Occupied and unoccupied purple olive shells. The shell in in the bottom right is occupied by a hermit crab. Empty shells can sometimes be found in abundance along the tide lines of beaches. Photos Stuart Higgs (top), Kelly Fretwell (bottom right), and Chanda Brietzke (bottom left). This snail is easily identified by its glossy, elongated shell. 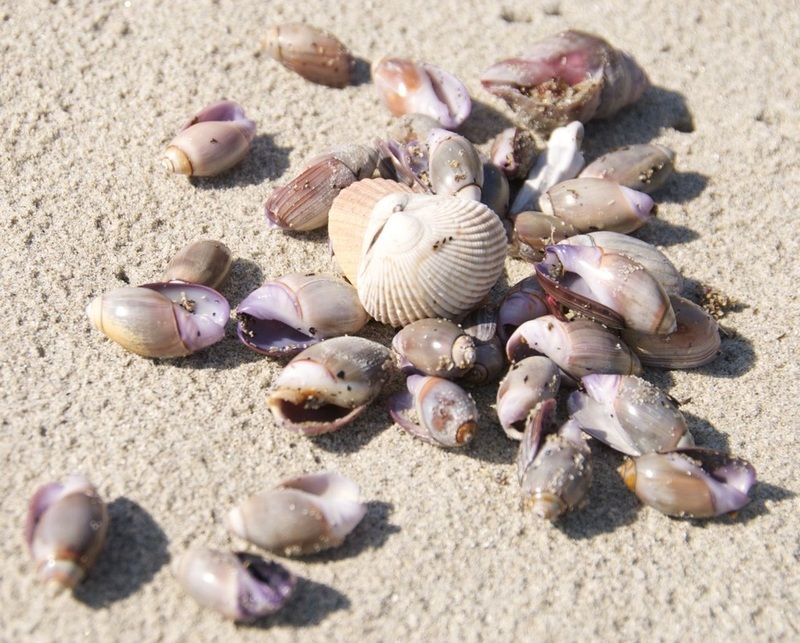 Colouring may vary a bit, from violet purple, to blue-purple or blue-grey, to tan with purple highlights; shells may also be solid in colour or striped. All shells have a distinctive violet colour around the lower tip of the aperture (opening from which the snail emerges). The shell, which has a pointed tip, reaches 3.5 cm long. When active the animal will cover the front of its shell with its foot to act as a plow while the snail burrows through sand. 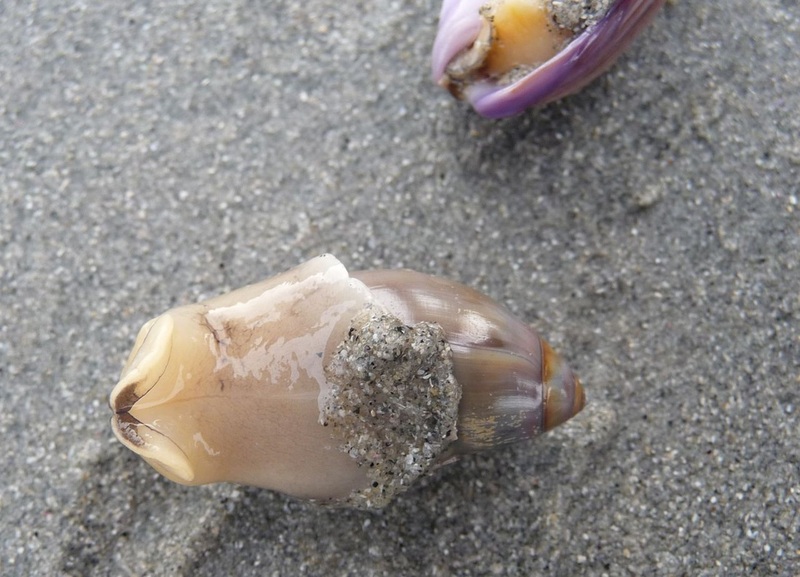 The purple olive snail can be found in the intertidal and subtidal to 50 m deep, on sandy, open shorelines from southern Alaska to Baja California, Mexico. It is active at night, and when the tide recedes it burrows down into the safety of the sand. This species often produces trails in wet sand, with trails ending in bumps beneath which burrowing snails may be found. Baetic olives (Callianax baetica) and zigzag olives (C. pycna) have similar shell shapes to purple olives, but are more commonly found in subtidal areas - and are less abundant than purple olives. You may find baetic and zigzag olive shells amongst purple olive shells along a beach, however. If the patterning of the shell is more complicated than a purple olive's thin, length-wise stripes, it is likely one of these two other species. The polished gleam of the purple olive shell made it a key decorative piece for the traditional jewellery and clothing of coastal First Nations. Empty shells tend to maintain this gloss, and so if you come across some on a beach you may want to do the same. 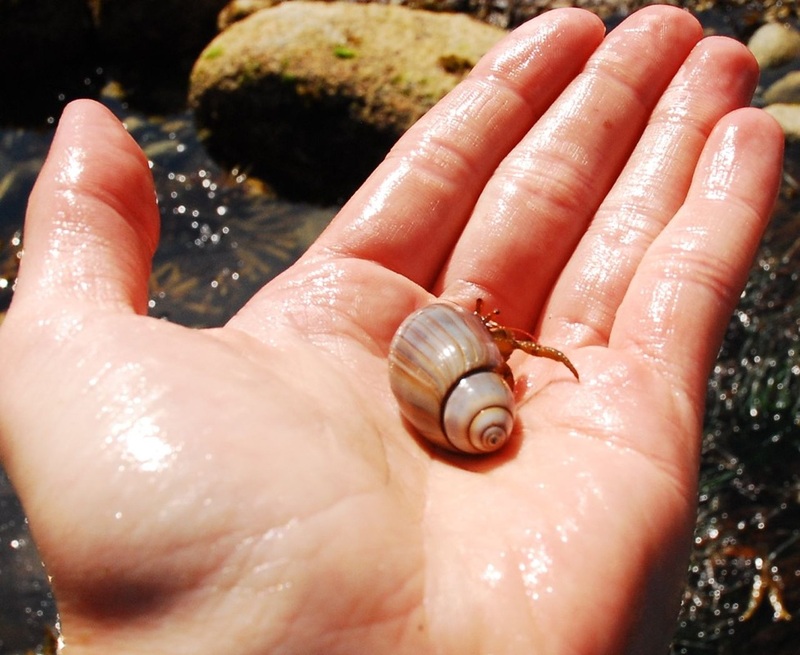 However snails can protect themselves by retracting into their shells and putting up a barrier called an operculum, and hermit crabs may take up residence in empty shells - so check that no one is home before you pocket anything! Moonsnails prey on purple olives. Successful moonsnail attacks result in a hole drilled into the snail's shell. A purple olive will try to crawl or burrow out of reach when being preyed upon, and occasionally will even swim. Callianax biplicata (G. B. Sowerby I, 1825). In Klinkenberg, Brian. (Ed.). E-Fauna BC: Electronic Atlas of the Fauna of British Columbia. Lab for Advanced Spatial Analysis, Department of Geography, University of British Columbia, Vancouver. Accessed on 04/06/2013.